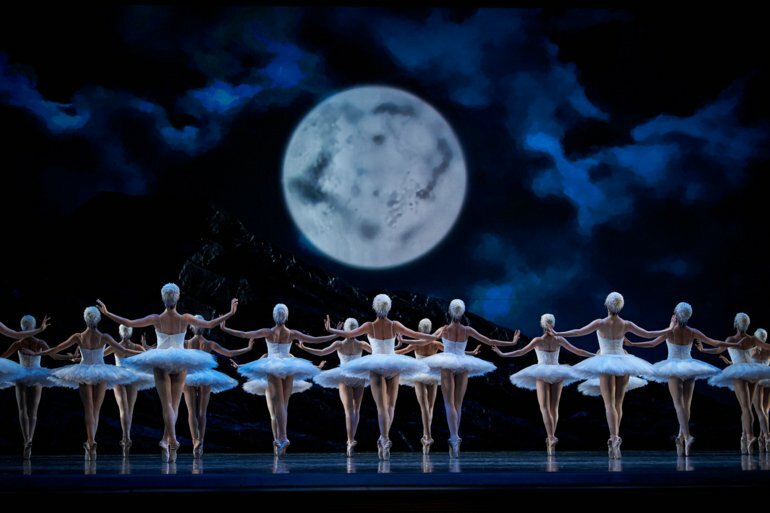 San Francisco Ballet is the United States’ oldest professional ballet company and school. Being situated in San Francisco, surrounded by innovation and creativity, this classic institution has successfully managed to evolve with the times and digital content now plays an important role for the company. With over 40 performances each year there is a plethora of content created which is used for marketing, as well as by press organisations. We caught up with Murray Bognovitz, Director of IT, and Erik Almlie, Media Assets Administrator, to find out how Digital Asset Management (DAM) helps them keep on top of their content. 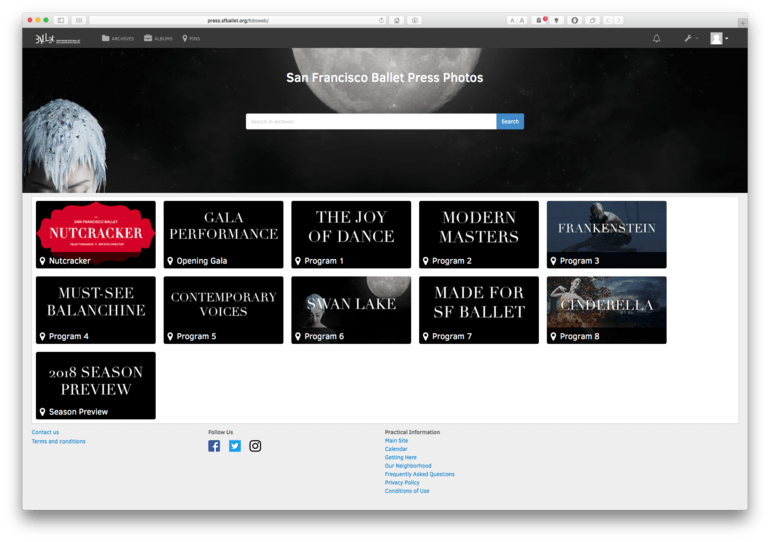 How has the rise in digital media impacted San Francisco Ballet over the last few years? Murray Bognovitz: Ballet is an art form that is at once both visual and musical, and the visual aspect with the artistic movement in dance has been photographed for many, many decades. With professional digital photography working its way into the 21st century, high definition digital cameras did such a great job for the ballet. It not only improved the photography of our ballets but also increased the quantity of images we received from photographers. The ballet, like a number of other places, went from a manageable number of photographs that were film-based to an overwhelming onslaught of digital images that kept coming and coming and coming. What did you do to combat the problems caused by the exponential increase in content? MB: We were asking ourselves what we could do to maintain these images. We started with a product that was ok for a single user, but for enterprise it wasn’t going to work. It also wasn’t going to do what we needed it to do from a cataloguing side. 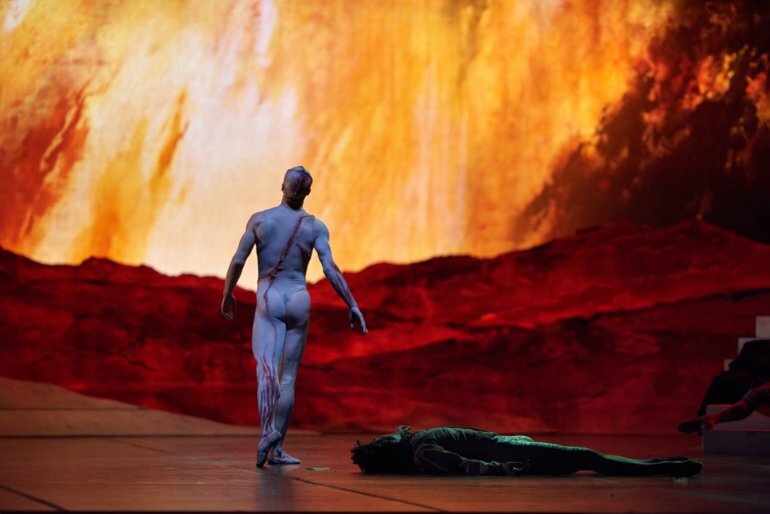 We required metadata to be added to each image, from the name of the ballet to who choreographed it to the music, the wardrobe, the lighting and then, last but not least, the dancers. All of that needed to be associated with each of the images because how else would we find them if we just dropped them into a folder on a drive in our storage network? That wasn’t going to cut it. 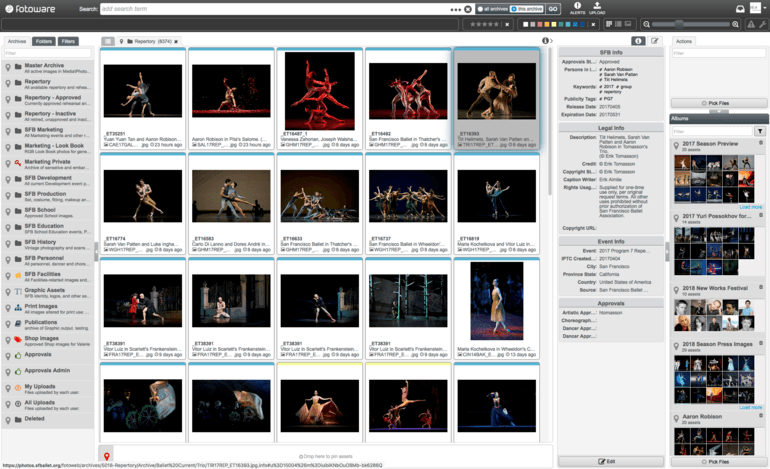 The ballet wanted and needed to be able to have a system of upload, metadata entry, ease of filing as well as editing, and an approval process for publication – so we decided on a Digital Asset Management solution. How was your image approval process managed before using DAM? MB: The ballet world, like a lot of other worlds, has photos that the press want to use which need to be made available and the one person in the organisation who’s responsible for the approval is our artistic director. Erik Almlie: We used to do image approvals by hand, which was very inefficient! We’d print out contact sheets which Artistic used to indicate their approvals. After Artistic had their say, we would print out photos and walk around the studios to find dancers and ask them if the photos were ok. It was nearly impossible for Artistic and the dancers to make an accurate decision by looking at a printout and doing all this printing wasted loads of paper. So there were environmental aspects as well as efficiency aspects that needed to be addressed. In addition, we had no way of officially tracking approvals as we were just taking the employees’ word for it and didn’t have any binding proof or a documented trail to follow. We had people initialling stuff as a sign of an approval, but honestly anybody could have done that! We really needed the implementation of a digital approvals system to conform to legal standards set by our company, as well as having a solid digital trail recording how images had been approved. In what ways has a DAM solution helped to improve your approval process? EA: Getting everything online solved the environmental issue, and formulating an approvals workflow solved the legal documentation aspect. We set up a system in our DAM where each group of users that participates in image approvals are assigned to different hierarchical classes. As images are offered for approval, it steps through each one of these classes sequentially. In our process the first group to review new photos is the Artistic Department, because it’s their intent to pick the images that best represent the Ballet as an institution and what best represents the choreography. Then, after Artistic’s review, anything approved by the Artistic Director becomes exposed to the next people down the approvals line, until it ends with the dancers making their own choices based on their performance. As each group makes their approvals, the images disappear from their approval queue, which signals the user they’ve done all their work for this round and keeps the clutter to a minimum. It also provides a clear documentation trail, as all approval choices made – the decision, who made it, and when – is all recoded in the metadata of each file. It’s incredibly efficient. MB: We needed workflow and the beauty of the product we invested in for uploading and cataloguing also enabled web-based access and online photo approval. It means that processes that had previously taken hours of people’s time, running around and chasing people, can now be done in a matter of minutes. EA: Usually when openings or major events happen I’ll be around for it because we want to get imagery through the approvals process, and get it out to the public as quickly as possible. The photographers will shoot the event and bring the images directly to me for ingestion. We’ll get anywhere between 300-600 images from each photographer uploaded onto our DAM. Because time is of the essence, we can’t really go through the standard approvals process, so Artistic, myself and perhaps the occasional choreographer will gather around my monitor, cycle through them and perform the initial approvals right away. Even though it’s a manual process, the same approval information is captured within the DAM. At that point, Artistic can go and attend to other important matters while I facilitate any dancer approvals through direct contact. After approvals are complete, it’s just down to processing the RAW files and performing final editing and touch up before they’re released through our DAM’s website to the press. How is the distribution of images to the press managed? MB: We’ve now created a sister website dedicated to the press. Once the approval process is done on one website, those photos can be moved easily over to the other website and members of the press with credentials can log in and download images for use. It’s unique in this way. Other companies do it, but it’s hard to get one enterprise solution to do it all. What you’ll usually find is that companies will have some sort of DAM or MAM (Media Asset Management) solution and then they’ll realise that they need to find an additional solution for upload and giving people access to their photos. Then they end up having to invest in another system to do that. We have an all-encompassing system for everything that we want to do. EA: We used to have a section of the website that was just for the press and we hosted publicity photos through it, but found the CMS of the website incredibly cumbersome. We couldn’t provide imagery quickly in the way we wanted, and couldn’t make important changes on the fly if we had to. Now that we host our own DAM supported publicity image site, when changes are needed it’s an instantaneous process. The old site required us having to go through a laborious editing process in a CMS and then republishing the entire website to get a change out to the public. It has made a huge difference in efficiency and ease of use for all involved, both within the company and the end users as well. Initially, some of the press users were a bit reluctant. There’s a lot of old school media types who don’t want or like change, and were reluctant to register for yet another website. But once they were on the site and used it, they realized they’re so much better off than what they had been used to. We’re able to provide more information through our DAM-supported publicity site than what we could do through the content management system on the website as well. How has this saved time compared to previous practices? EA: If we had to change out a single photo through our website’s CMS, we’d first have to create three different versions of the photo. We have different classes of press entities so we need to provide appropriately sized versions for printing and web use, plus a thumbnail for the site. Then we’d upload those files into our CMS and then proceed to editing the entry. In total, this would probably take between 15-25 minutes in total just to change a single item – that is if somebody else was not already changing something on the website and I had to wait in the queue to get my changes up! Publishing photos after an event would usually take 2-3 hours. It was incredibly inefficient because we’d have to make these different versions, upload them, and then create an entry for each one individually, requiring information in 5 different fields for each image as the CMS wasn’t able to pull anything from metadata. Now it’s a breeze in comparison. It’s incredibly convenient to have all important metadata automatically displayed on our DAM website, and any change made at a later time doesn’t require making a new copy and republishing the whole site; it’s just done, since it’s pulling information from the DAM system directly. In addition, the new website can create versions in various formats and resolutions for our end users, eliminating all the versioning work and providing a wider array of choices. In short, it’s a huge time and labour saver. How many images do you estimate are archived each year? EA: We calculated that once and it was something ridiculous, up to 20,000 images per season. We shoot more than 40 performances per year and if you multiply that by an average of 500 photos per performance you get a rough idea of where we’re at. That’s also not including the thousands of images we get from each social event we host. Those’ll be about 4 hours long and we get about 2,000-3,000 images of every famous person, every donor, trustee, and every dress - all that content important to the social aspect. Add to that the 30 or so performances Production records to video, the 20 to 30 TV spots and social media videos we produce each year, and other sources of assets like the School, Education, Marketing, and Publication Design, we have a lot to keep track of. We have the DAM divided up into different sections to handle all this, and each one requires different workflows and methods of categorization. They all live in separate archives, but it’s all handled by the DAM system. Want to learn more about Digital Asset Management? Go Behind The DAM and subscribe to our blog to find out how other organisations manage their important assets, saving time and money in the process.